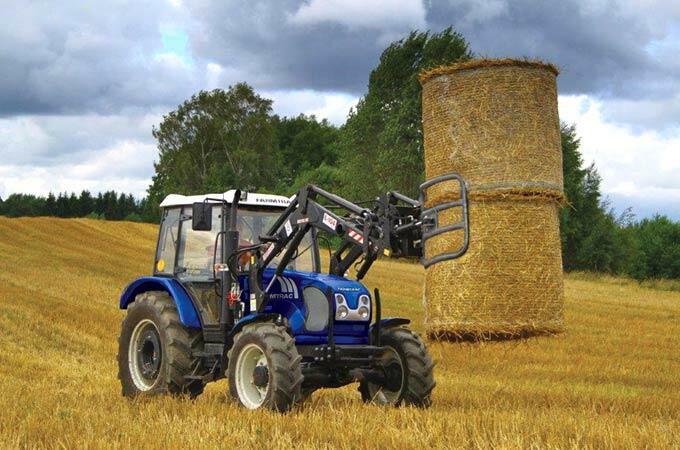 The Euro hitch log grab is used for loading and unloading round timber (wooden bales). Swiftly pick logs from storage, load them onto transport vehicles or handle them between work sites. With a maximum lifting capacity of 1000kg, this front end loader attachment can be used for forestry and saw mill applications. The strong grip allows transportation of logs over short distances – each log is held fixed in place with a moving arm, operated by a hydraulic cylinder. The Euro hitch log grab – manufactured in Europe. Lift and transport up to 1000kg of logs over short distances. The Euro hitch log grab is available for all Farmtrac DT series front end loaders and other tractors loaders with a Euro hitch. It has a two year manufacturer’s warranty and is fully supported by SOTA Tractors. Each log is held in place by the sturdy grip attached to the moving arm. MFLG1100 Euro hitch log grab.